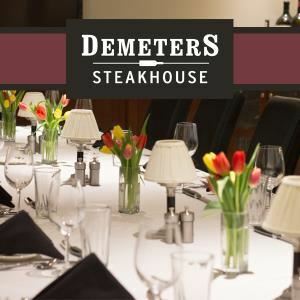 Demeters Steakhouse is a classic American steakhouse with a warm, contemporary atmosphere, serving all-natural USDA prime steaks, fresh local seafood, sumptuous modern cuisine and a Wine Spectator award-winning list of bottled wines. The bar features a casual grill menu with handcrafted cocktails, a wide selection of scotch and whiskey, and premium red wines by the glass preserved by the Enomatic system. Demeters offers personalized in-house private event services, including a variety of plated dinners, buffets, passed hors d'oeuvres and stationary presentations. Our private room comfortably seats 30 guests and has a wall-to-wall windowed view of our cutting-edge kitchen facilities. It also features a 90" fully A/V equipped TV with Comcast channels and surround sound. In addition to the private room, Demeters also has an all-season patio that comfortably seats up to 40 guests. With unparalleled, attentive service, Demeters is the ideal location for wedding rehearsals, corporate functions, cocktail socials, holiday parties and more. Welcome to La Pièce - The Room, the original showcase of Designs by Anna. The warmth and comfort of New England meets the chic style of New York in our historic mill building along the beautiful Winnipesaukee River in Tilton, NH. Anna redesigned the rooms to be clean-canvas spaces, featuring polished reclaimed wooden floors and copper finishes. From floor-to-ceiling, our simply elegant rooms can be transformed for you, whether you choose a neutral palette and simple decor, or splashes of color with fine linens, special lighting, a lounge area, and more! From Design to Food to Mixology, our team works with you - within your means - to offer an experience for you and your guests that goes beyond what is traditionally expected. Call us now to book your personal tour! The Event Center at Hampshire Hills can host your party, company event or wedding with ease and perfection. We can host 10 - 3000 guests, indoors and out, all seasons for all reasons. Whether you are about tradition or thinking out of the box, we can help you plan a memorable, fun, productive event. The Event Center at Hampshire Hills is committed to providing the finest culinary selection for you and your guests. Our menus are presented with many options and combinations, and our Head Chef and his staff willingly accommodate any specific preferences. Hosting a special event in Portsmouth, New Hampshire? Treat your colleagues and clients to sophisticated surroundings and a delicious culinary experience at the Portsmouth Harbor Events & Conference Center. Our sustainable, fully flexible, state-of-the-art event space provides a modern, fresh flair to take events to the next level. Signature Portsmouth, NH Seacoast weddings are a specialty at Portsmouth Harbor Events & Conference Center. Our charming wedding venues marry classic coastal elegance with versatile event space that is certain to provide the perfect backdrop for your special celebration in Portsmouth, NH. Our understated elegance can be easily customized to reflect your unique style, creating a personalized experience for you and your guests. With over 4,600 square feet of flexible event and pre-function our New Hampshire wedding venue can effortlessly build an event that brings your vision to life and comfortably accommodates 15 – 300 guests. Our experienced and attentive staff takes care of the details so you can enjoy every moment of your special day. We’ll work with you to create an unforgettable experience based on your budget, style and guest needs. Have your wedding, office party, birthday party or family reunion at the Hunt Memorial Building! Rental of this elegant venue includes use of the main and small reading rooms, the foyer and the kitchen. Rental period is from eight a.m. to eleven p.m.. Wedding packages for rehearsal and ceremony are available. Non-profit rates available. Contact the building administrator for more details.